These three delightful lodges, The Farm at Cape Kidnappers, the Lodge at Kauri Cliffs and Matakauri Lodge, are once again offering a Winter Special for Australian and New Zealand residents. All three lodges are of the highest standard and provide a fabulous luxury stay. And you have choice, as they are spread through some of the most beautiful parts of New Zealand. The Farm at Cape Kidnappers overlooks the coast in the Hawkes Bay. It has an excellent golf course on site and is close to many other activities. The Lodge at Kauri Cliffs overlooks the idyllic coast of the Far North and also has a noted golf course on site and the gorgeous private Pink Beach for evening picnics. Matakauri Lodge overlooks Lake Wakatipu in the deep south and is close to all things winter - skiing and snow boarding, hiking and mulled wine. Your stay is inclusive of pre-dinner drinks, a 3 course dinner and a full breakfast, plus use of most lodge amenities. Also included is your choice of either a day of unlimited green fees or a 60-minute spa massage treatment per person for each night you stay. Stewart Island is New Zealand’s third largest island, and one of its most beautiful. But compared to the two main islands, North and South, it’s tiny. Mostly covered in native forest and national park, and surrounded by remote beaches, wild sea and incredible bird and sea life, it also has a very small population, so is a blissfully quiet place to visit. See the best of Stewart Island on this 5 night/6 day cruise on the Affinity, a sturdy vessel purpose-built for these southern water cruises. Step back in time to a slower pace of life and unwind. Stroll through the shops and view the sights of Oban, Stewart Island. Cruise includes an hour and half guided bus tour of the Island, hear about Island life from the local guide. Halfmoon Bay welcomes you with its tall Blue Gum trees. Explore the rock pools and walk the coastal track around Paterson Inlet. Scenic walk to Ackers Point, Half Moon Bay, visit an original old settlers cottage. Take a bush and beach walk to Port William. Fish for Stewart Island "Blue Cod", while surrounded by the large Mollymawk seabirds. Cruise the clear clean waters to Port Adventure and explore its golden beaches and hidden inlets. Experience amazing sunsets and sunrises. Ulva Island Bird Sanctuary – hear the birdsong of Tuis, Bellbirds, Robins, Kakas, Keas and the rare South Island Saddleback. Enjoy a three hour guided tour of Ulva Island with a local guide. Discover the natural beauty of Stewart Island for yourself. You may see Yellow Eyed Penguins returning to shore in the evenings. Enjoy a beer or wine at New Zealand’s Southernmost Hotel. Price: $NZ 2,599 pp including transfers from/to Invercargill. Single supplement available. The cruise is fully catered. Bathrooms are shared, there’s air con on board and a 4 metre inflatable tender to get you ashore and back. With limited numbers this cruise will sell quickly. Only available 6 - 11 May 2019. Email us today for more info or to book your place. There are just 5 cabins left today. The Lewis Pass is the northernmost road crossing of the Southern Alps. Whether you’re driving north from Christchurch, or south from the Nelson region, you’ll drive over this beautiful area of forested alpine landscape around halfway through your trip. 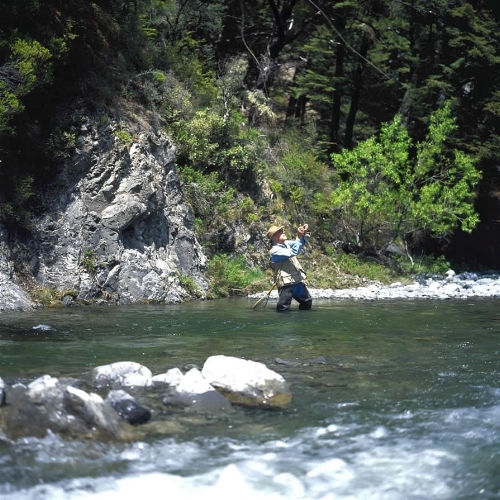 Part of the greater Lewis Pass National Reserve, the area is home to tumbling rocky rivers, dense temperate beech and podocarp forest, and far-reaching alpine views. There are many walking/hiking trails through the area, but many require some experience of high country hiking. The summit of the Lewis Pass road allows access to a short Alpine Nature Walk around a tarn (a small lake) and is very accessible for families with children or those unused to alpine walking. It can be cold up there any time of year so take a jacket with you, and wear some robust footwear. The boardwalks can be a bit slippery in ice or snow, but most of the year they are fine. Take your time on this short 20 minute walk to look for a distant waterfall dropping from the mountains, far-off alpine valleys opening from above the treeline, and wild clouds rushing up through the pass. It is an invigorating place to stop. It is unclear to me why the Abel Tasman coastline, on the northern edge of New Zealand’s South Island, is called that when the 18th century Dutch explorer didn’t actually see it. But whatever its name, the clear green water and shining golden sand of this beautiful coastline is well worth a visit. 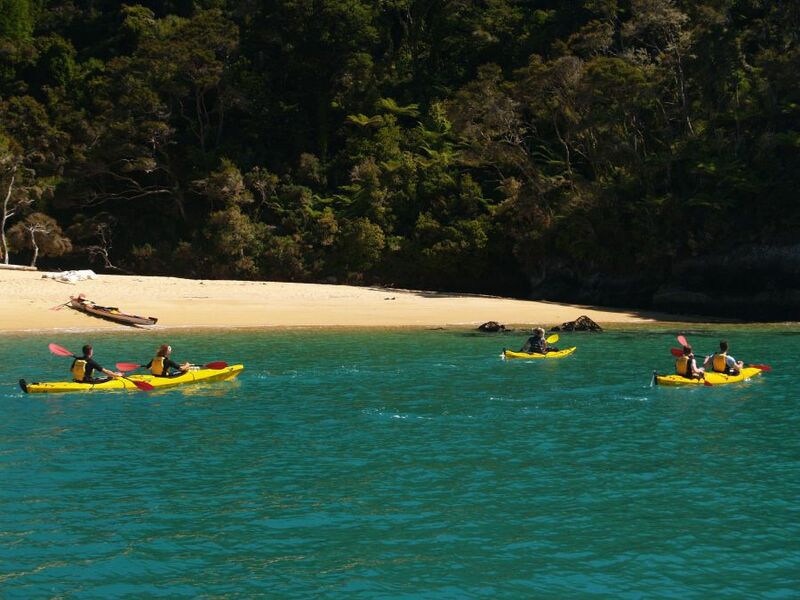 Most visitors walk the Abel Tasman National Park coastline, and a few choose to paddle it in a sea kayak – quite a few in fact. But to me the best option to see the area is to sail along this historic coastline. This is a perfect day tripper experience without a backpack, a hiking boot or a blister in sight. On a still morning in early summer the light at Marahau is crisp and blue. The sea is like glass as it creeps in over golden yellow sand flats. The bush-covered hills of the national park rise up behind this little seaside village, sheltering it from the cool sou-westerly wind drifting off the snowy mountains in the nearby Kahurangi National Park. It’s a great day to go sailing. As soon as the tide is high enough to carry us out of the bay we cruise off slowly under motor, our boat clearing the maze of channels and sand banks in a matter of minutes. The skipper has obviously spent time on these waters, as he steers with one hand while watching the depth of the water, delivering a safety briefing in record time and launching into a five minute run-down of the historic area we are sailing into. This area was always popular with local Maori, long before the Europeans came through in their little white sailing ships. Evidence of middens and fertile, ancient kumara gardens sit well between stories of local chiefs and visiting waka (canoes). During their exploratory voyages both Abel Janzoon Tasman and James Cook managed to miss this stretch of coastline completely, but French lieutenant Dumont D’Urville more than made up for this with his extensive visit in 1827, leaving the coastline renamed with a distinct French flavour – Adele Island, Coquille Bay, Astrolabe Roadstead, Isle de Pecheur (now Fisherman’s Island) and Anse du Torrents (now Torrent Bay). Other names such as Watering Cove and Observation Beach also tell of his activities while in the area. The sea along the Abel Tasman coast is a particularly nice shade of translucent green. If there’s been no rain for a while the visibility of the water is intensely clear. We look over the side to see huge chunks of granite metres below the surface, which have fallen from the land over preceding millennia. Tiny blue penguins paddle beside us and rocket-powered gannets dive from the sky to disappear into the water without a splash. Their breakfast obviously moves fast. Further up the coast there are fur seals around Tonga Island and some days whales or dolphins cruise through these coastal waters. But today we are headed for Te Pukatea Bay, just beneath Pitt Head, where the boat drifts ashore to drop us, almost dry-footed, on the sand for lunch. Pukatea is a horseshoe-shaped bay, ringed by green bush and steep hills, which looks out to the eastern side of Tasman Bay far in the distance. Lunch is a casual affair – bare feet, toes digging into the sand as we sit above the high tide mark. Everything is provided, including bubbles and some nice local wines, as we kick back and enjoy the warmth of the sun. Just a short walk over the hill behind us is the Anchorage – a favourite weekend spot for local yachties – and further around, Torrent Bay. Although this area is national park there are still pockets of private land in many of the bays and Torrent Bay is one that has a number of cottages and holiday homes. It’s a busy place in summer considering there isn’t a road for miles. Everyone comes in by boat. But lunch and a quiet siesta later we’re ready to man the decks and haul on the sheets for a fast downwind ride back along the coast. There really is no better thing to do on a yacht plying this sunny coastline than to sit on deck, spinnaker sheet in hand, tweaking it from time to time as we fly downwind, following the huge red sail back down to Marahau. Fiordland has become one of the iconic travel destinations in New Zealand. It is, at times, startlingly beautiful, dark and mysterious, remote and wild, huge, wet and empty - except Milford Sound, which can be all of the above, and busy. But there's a good reason for this as Milford is the only place in Fiordland where you can actually drive through to the fiords, get on a boat, and explore. Read more …. Leaving from Waikawa Bay near Picton early that morning Tutanekai was eager to set out. With Peter at the helm and Tukatai running round tidying up and getting people comfortable the weekend held great promise …. Explore deep in to the Southern Ocean and follow in the footsteps of Sir Douglas Mawson - an early explorer and scientist who visited. Westhaven Retreat is an enticing luxury lodge perched out on the north-west corner of Golden Bay in the South Island, in a wild, remote spot just waiting to be explored. 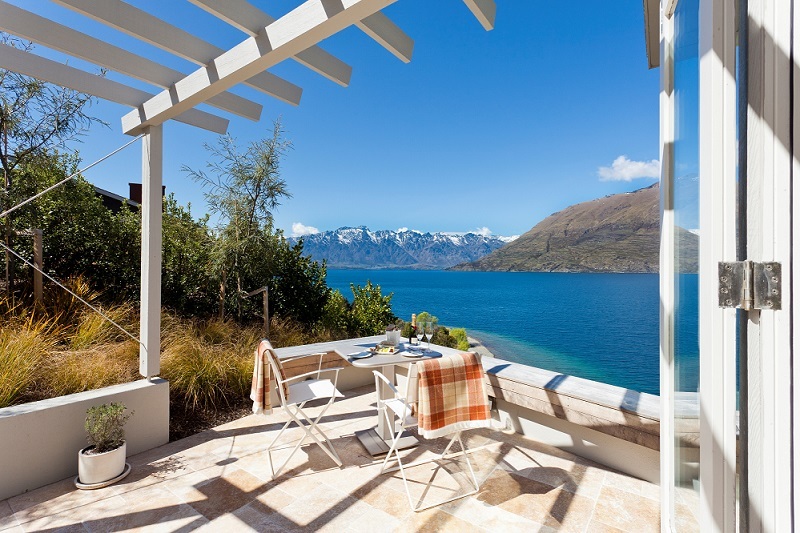 Sitting right on the lakefront in downtown Queenstown Eichardt’s provides the perfect luxury stay on a journey to the southern lakes of New Zealand.